Law firms that understand their economics are more likely to capture and maintain an edge in today’s highly competitive legal market. Optimizing their economic model, or tethering it to the market, achieves even greater stability and larger profits for the firm. If you don’t have an operating model and want to develop one or want to improve your current model, here is how. 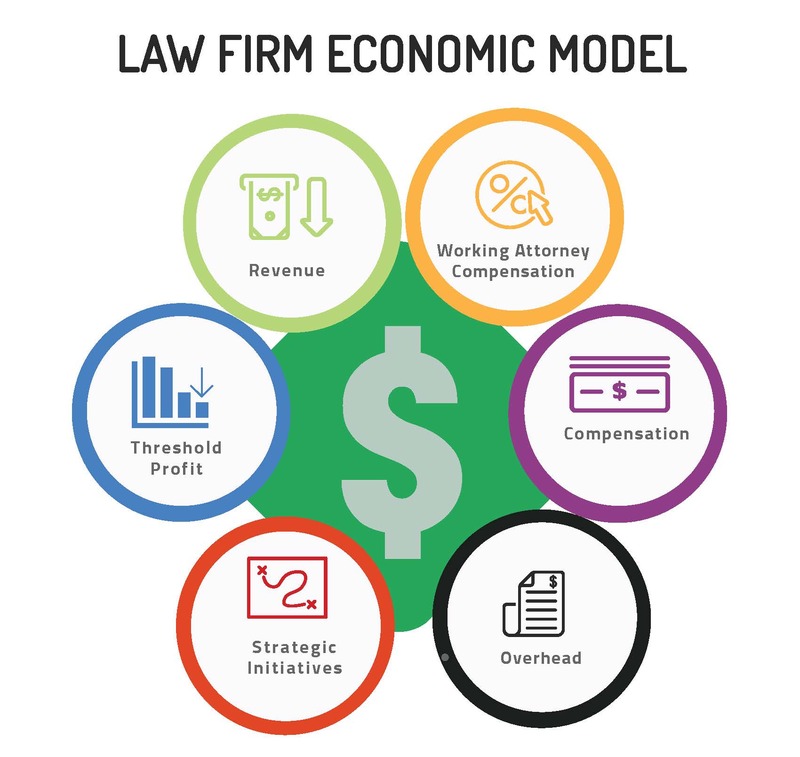 What is an economic model for a law firm? define the threshold (minimum) and targeted profit levels. When a law firm is able to operate within a defined economic model, they have a competitive advantage. Viability erodes when a firm loses sight of its economic model, doesn’t have one, or fails to keep it current. In our experience, once a firm enters a decline phase it has a less than 50% chance of regaining its edge. The fees you collect, regardless of how you produce them (hourly, contingent, fixed, etc. ), count as revenue. Profit models apply to all firms. The differences between firms is shown in their abilities to adjust to how revenue is earned; their pricing approaches, and their market fit. For example, a firm that operates on thin margins and higher volumes (think insurance defense) will need a tighter variable (costs that increase with volume) cost model due to the potential negative impacts associated with an increase in volume. In plain terms, if a firm is underperforming on each hour worked, more hours only makes it worse. Alternatively, the priorities of a firm with more profitable revenue streams may focus less on certain elements of their cost models and focus more on items that serve the generation of the higher margin revenue (E.G. expanding the compensation range for talented lawyers). Cost management is also important to higher margin firms but their models may have more slack in them or focus on different aspects. Understanding client price sensitivity within your markets, competitive supply, your firm’s capability and capacity, and the level of market demand are all essential to creating your economic model. The important thing is to understand where your firm fits into the market and to then build your model to optimize performance in these parameters. We recommend a base and bonus approach to compensating lawyers for the work they produce with their own hands. The most common approaches include lower base salaries and higher bonus pay and higher base salaries and lower bonus pay. There are pros and cons associated with each approach but consistency is an important factor. Frequent changes to compensation plans can cause instability in the cost structure, lawyer frustration, and turnover. Compensation approaches are typically different for junior lawyers and senior lawyers. Generally, we recommend shifting compensation risk (increase in incentive compensation portion) to lawyers as they become more experienced. Working attorney compensation typically ranges from 30% to 40% of fee collections. For highly profitable lawyers, additional bonus compensation is necessary to incent longevity and continued production. Whether a working attorney receives a base salary, fee sharing formula or a combination, we recommend keeping the guaranteed portion within the 30% to 40% range and rewarding profitable timekeepers with a bonus after threshold profit is attained. We will address setting a threshold profit level later but it is a necessary element of the bonus calculation. *If a firm has a strong cost accounting system that can more precisely identify the variable cost items directly attributable to a timekeeper, a contribution margin approach (Revenue- All Related Variable Costs) is possible. In our example, we only allocate the more material direct cost items (payroll and benefits) and we use a general overhead allocation for the remaining cost after payroll allocations. Finally, some firms apply an average employee benefits percentage in lieu of a specific percentage by attorney. Their rationale is that they don’t want to build an economic model that relies on hiring lower benefit cost employees. **Including or excluding fee sharing compensation for the origination portion of originated and worked timekeeper collections impacts the bonus percentage (a firm’s basic compensation theory is an important factor when creating an economic model ). When setting the bonus percentage, it is necessary to remember that the amount left after paying bonus money to the timekeeper, must also compensate the originator of the work. An adequate threshold profit can protect the firm, but we suggest running a few assumptions before setting the bonus percentage. Complex compensation systems, while often necessary to adequately weigh all pay factors, are often eschewed by lawyers. The result is that law firm compensation systems are frequently oversimplified and inadequate. Regardless of the legal entity makeup (LLC, LLP, C Corp, Sub S) the recommended profit model only considers the total amount available (profit) to pay owners. How profit is split between the owners is not considered in the profit model. We mention it now because the partners’ compensation system can affect the pay of non-owner lawyers. Origination pay at the non-owner level (a cost) is typically a portion of gross fee collections. Depending on the compensation plan, origination pay can vary and typically ranges from 10-25% of collections. In well-run firms, risk, profitability, and performance can all affect the pay rate for originations. Again, equity partner compensation is a different subject and not considered in the economic model. The economic model is only concerned with creating the total pool of profit for the equity partners to divide. In most law firms, paying for working attorney and origination performance is well-established. Paying non-owner attorneys for file management responsibilities is more difficult and less common. Junior lawyer supervision or operational client management is a justification we often hear when working attorney base compensation exceeds the typical pay range. For example, it is not unusual to encounter a senior lawyer whose pay exceeds 40% of their working attorney collections and who also has no origination credit to justify the compensation level. When analyzing these situations, we sometimes find the compensation level reflects managerial efficiency at the client and/or file levels. To account for the managerial factor, we recommend an objective compensation approach to reward managerial efficiency. The funding for this compensation pool can come from the origination pool. For example, assume a firm compensates 15% for originated work and desires to recognize client managerial efficiency. We recommend 3-5 % of relevant fee collections for client and file management contributions, which in this example would reduce the origination pool to 10-12%. This approach is only applicable in situations where an originator has non-owner lawyers managing all or part of their caseload. Equity partners who share client responsibilities are typically rewarded under the equity lawyer compensation plan. Setting the actual compensation percentage is best done after considering strategic objectives and the significance of the contributions. Compensation approaches to non-attorney billable timekeepers are typically less formulaic and essentially all base salary. Firms that have strong paralegal demand may have more involved systems. When building out your operating model, you can create a separate category for non-attorney billable timekeepers or you can include them in overhead. The choice depends on the value of the information and how it will impact decision-making. Overhead includes the remaining expenses that are not included in any of the compensation categories. How overhead is allocated within the firm affects its economic model if any aspect of timekeeper pay is profitability based. Often times overhead is considered a fixed cost or as an area with limited impact on the results of the firm. I am sure that you may have heard the expression about the limited value of counting paper clips. Again, this attitude toward overhead control is another oversimplification of an important element of a firm’s economic model. All these areas are connected and if overhead is just a couple of points too high, it impacts the amount available for the people who deliver results, which can significantly impact the stability and profitability of a firm. It is possible to further organize these overhead costs into fixed and variable buckets. Fixed costs generally (to a point) don’t increase with more volume and variable costs increase incrementally with volume. Not to try to confuse anyone, but whether a cost is fixed or variable often depends on the measurement used. For example, if your software license costs are $100 per user and you add a new user your costs for the software increase by $100. If you are measuring cost per billable hour, the software license user cost does not increase with more hours. Again, the measurement is the key. Good overhead adds value to the client service experience or the efficiency of the firm. Bad overhead provides little or no value to the client service experience of the firm and decreases the efficiency of the firm. Excess office space, firm cars, apartments, unstaffed branch offices, and stadium suites are examples of overhead often hard to justify. Good overhead is often lumped with bad overhead and can kill funding for innovation. For example, insufficient money for a marketing automation system because the rent is too high. Not only is the excess rent onerous, but it is crowding out funding for high return investments. Nothing is more frustrating when we hear a managing partner or committee say they cannot afford an improvement to a mission critical system or process. It is not a question of affordability, it is a question of priorities. In almost every instance, the elimination of bad overhead opens up funding for high return investments. The process of building an economic model forces the firm to confront their bad behaviors that lead to poor performance. Some overhead is unavoidable and even legally required, but wherever possible, overhead expenses should contribute to better client service. Utilizing advanced financial reporting that provides insights into client profit improvement. There are many others. We suggest every firm allocate 2-4% of their current year gross revenues to strategic initiatives. Firms that have a capitalization policy are better able to make strategic investments. When building an economic model, we recommend you consider a minimum acceptable level of profit before paying incentive compensation. A threshold percentage of revenue or an absolute dollar value can work. Setting threshold profitability forces a firm to consider the value they offer to the attorneys who work with the firm. For example, a firm may command a higher threshold profit if they can provide lawyers with better revenue generating opportunities than are readily available in the marketplace. Put a steady stream of work together with a high billing rate and the threshold can expand. Alternatively, firms that provide less value or lower rate structure, may have to live a lower threshold profit. Accounting and financial modeling can only take you so far. Setting a threshold profit is a strategic exercise and a valuation of the firms collective offering to attorneys. A difficult part is to decide whether the threshold profit level should apply uniformly across lawyers and practice areas within the firm. In our experience, some variation in threshold profit is necessary. For example, higher billing rate or experienced lawyers can more easily meet the threshold profit targets than lawyers working on lower rate clients. If it is strategically preferable to hold different practice areas to different standards, the threshold profit will vary. Much also depends on how much control practice areas have over their overhead spend. The easy part is to define the level of threshold profit. Much of this economic modeling is a result of manipulating the components. For example, if market wages for working attorneys average 35% of the amount a firm can charge clients for their services, the model must recognize this level of compensation and management must look elsewhere for improvements. Another difficulty arises when an economic model is at war with itself. Competing priorities can exist between practice areas that need a lower cost structure and those that are less focused on cost. In these instances, strong leadership and flexibility in the management approach to practice area cost management are necessary. For example, rigid hiring standards that apply uniformly to all practice areas can create serious issues. If the differences are too deep, it is difficult to maintain the construct of the firm - some stay and some leave. Building an economic model is as much a strategic exercise as it is a financial one. Both disciplines must have input into the process. No financial model ever implemented itself and plenty of strategic plans have failed due to insufficient profitability. A good process, the right modeling tools, and experienced support can reduce the frustration, time and fatigue related to creating a financially and strategically sound economic model.